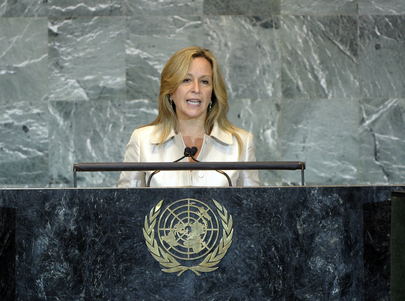 TRINIDAD JIMÉNEZ GARCÍA-HERRERA, Minister for Foreign Affairs and Cooperation of Spain, said the international community’s capacity to address any type of crisis in a timely manner was limited, which stymied defeat of poverty and implementation of sustainable development policies. Advancing women’s equal access to the labour market, as well as to the political and social spheres, was essential to overcoming the current economic crisis. Welcoming the success of popular movements in Tunisia and Egypt, she said Spain joined the international efforts to strengthen the transition processes in both countries. The Libyan people also could now live in a democracy after decades of dictatorship. The global community was obliged to help them in their reconciliation and reconstruction processes. She condemned the repression of civilian demonstrators by Syrian authorities and reiterated the need for international measures to stop such actions. The recent revolutions and uprisings had deep consequences, including for Palestinians, whose legitimate aspiration to enjoy freedom could not be left aside in the wave of change. The Assembly’s sixty-sixth session could be remembered as the one in which non-member Observer State status was granted to Palestine, a decision that Spain could support, as a solution to the Palestinian-Israeli conflict required the existence of two States — Israeli and Palestinian — living side by side in peace in security. Indeed, after more than 60 years of conflict, the global community should send a clear signal to Palestinians underlining its desire to see the creation of a Palestinian State. Palestinians could find in that new status a stimulus for the prompt resumption of negotiations. Stressing that Al-Qaida’s terrorism must be prevented from being reinforced in the Sahel, she urged the international community to be united in that same fight in Afghanistan and Pakistan. The tenth anniversary of the attack on the “Twin Towers” was a reminder that, despite determined efforts against such actions, it had been a bloody decade. Spain had joined the Global Counter-Terrorism Forum, launched a few days ago, and firmly supported United Nations initiatives under the Global Counter-Terrorism Strategy. The situation in the Horn of Africa was “simply unbearable”, and Spain was helping to alleviate the famine in Somalia. The fight against poverty was a priority, and to realize the Millennium Development Goals, she urged States to make the most of the 2012 “Rio+20” summit. As for international peace and security, she said close to 1,200 Spaniards participated in United Nations peacekeeping operations. She hoped that States would support Spain’s candidacy for a non-permanent seat on the Security Council for the 2015-2016 period.